We are on a slippery slope of exclusion, and it is important to take immediate measures to change direction. The beginning of 2017 has been challenging for activists around the world. Many women activists, for example, were unable to attend this year’s Commission on the Status of Women (CSW61) in New York. And in the middle of CSW61, UN Security Staff removed women NGOs from the building after 6pm while negotiations on the draft agreed conclusions continued late into the night. At the same time, some were denied entry to the UN Security Council Chamber and the opportunity to inform Member States about the situation in their own countries. This is only a tip of an iceberg. These actions represent another period in a long history of restrictive migration, refugee and asylum measures that subject women and their families to hate crimes, detention, deportation and family separation, while undermining core universal human rights regarding migrant and refugee rights, and worker protections. Some states are currently developing policies and changing their development aid programmes to prohibit women’s access to education and services that promote their health and well-being. As a matter of principle, and in solidarity with the women denied access to the UN, the Women’s International League for Peace and Freedom (WILPF) decided not to participate in the formal CSW61 process. Other organisations decided to do the same with a view to expose the ways in which state policies serve to undermine the human rights of women and girls. And WILPF shared an open letter to ambassadors in New York and Geneva, worked with its grassroots network and partners to raise awareness of #MissingVoices at the CSW61 in diverse spaces, and moved its planned CSW-events with partners in Syria, Libya and Yemen to the Human Rights Council in Geneva. It is a stated core principle and belief of WILPF that international peace must be sought and guaranteed through the multilateral system. And WILPF has engaged, supported and participated in the various functions of the UN system since its inception – and will continue to do so. It is incumbent on Member States to uphold the Charter of the UN, human rights and international law. In fact, the UN has obligations to uphold its own Charter, principles and practices agreed and acted upon over decades and grounded in human rights law. Clearly, the current political environment undermines these obligations and indeed, the integrity of the UN; it prevents inclusivity and is discriminatory on prohibited grounds. The current emphasis on conventional forms of state security then easily translates into policies like the US travel ban, which, rather than resolving anything, plays into the normalisation of war and violence and othering and penalises people who were working to end the very conflicts that the ban claimed to combat. There are simply too many voices that are turned into #MissingVoices, voices essential for creating sustainable peace and gender justice on a global scale. CSW61 has now ended, but members of the feminist movement have a duty to ensure that the conversation on women’s meaningful participation will continue beyond the CSW. We are on a slippery slope of exclusion, and it is important to take immediate measures to change direction. WILPF and its partners are therefore planning a series of initiatives in order to overcome intransigent obstacles to women’s meaningful participation in the UN system. The first event in this series was the 20 April 2017 Tweetathon in collaboration with the Association for Women’s Rights in Development (AWID). The Tweetathon focussed on the on-going and deepening discussion around the shrinking space for civil society engagement at the UN. 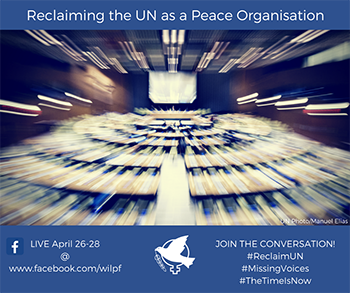 And from 26-28 April 2017 WILPF will be convening and UN officials, Member States and civil society will continue this discussion. This forum will bring together various stakeholders in order to bring to light today’s obstacles to women’s meaningful participation in the UN system. The invited participants will assess the current modalities for participation and UN response – what is effective and can be replicated, what obstacles are faced and concrete proposals to overcome them; examine the existing mechanisms on gender integration and develop concrete proposals for improvement or reform; and consider how to strengthen participation and the monitoring of implementation by Member States and the UN. A lot of work is ahead: ongoing obstacles continue in the shape of visa rejections, sidelining on panels, and a lack of action on the Women, Peace and Security commitments – just some examples. Join WILPF in taking further action for change!